1. Escher N, Kob R, Tenbaum SP, Eisold M, Baniahmad A, von Eggeling F, Melle C.
Various members of the E2F transcription factor family interact in vivo with the corepressor alien. 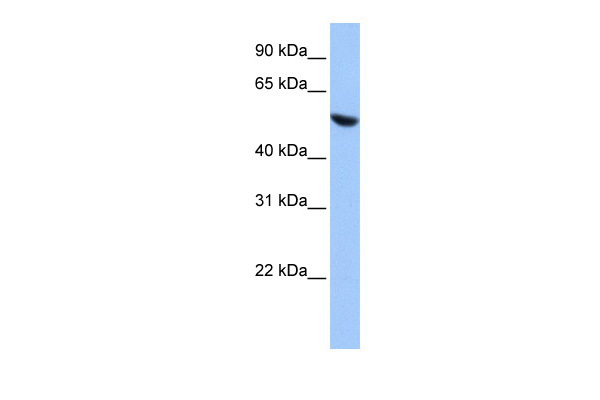 COPS2 polyclonal antibody (A01), Lot # 060501JCS1 Western Blot analysis of COPS2 expression in SJCRH30 ( Cat # L027V1 ). COPS2 polyclonal antibody ( Cat # PAB6396 ) staining ( 1 µg/ml ) of NIH/3T3 lysates ( RIPA buffer, 30 µg total protein per lane ) . Primary incubated for 1 hour. Detected by western blot using chemiluminescence. 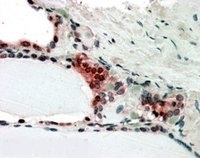 COPS2 monoclonal antibody (M02), clone 4B12. 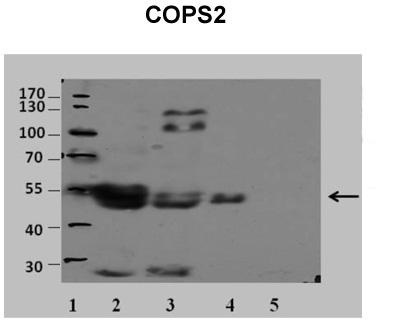 Western Blot analysis of COPS2 expression in Raw 264.7(Cat # L024V1 ). 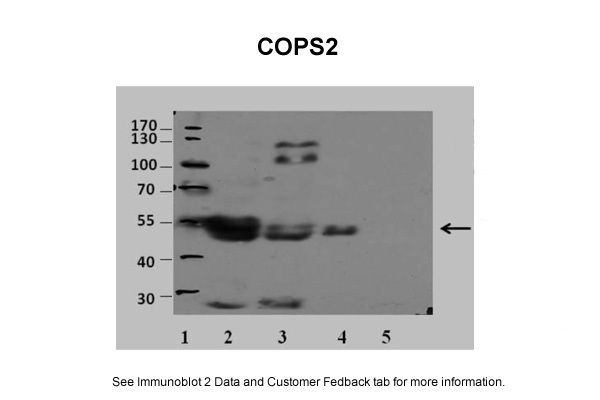 COPS2 monoclonal antibody (M02), clone 4B12. 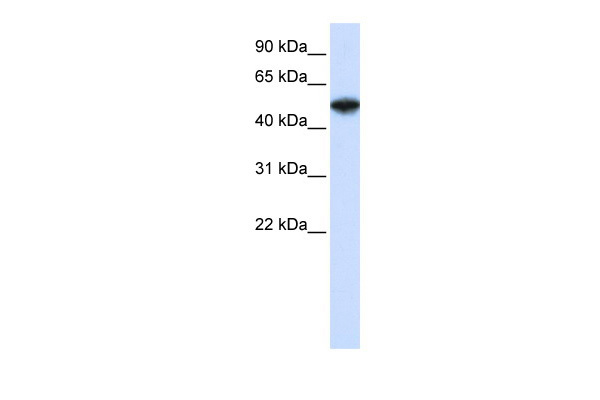 Western Blot analysis of COPS2 expression in Hela NE ( Cat # L013V3 ). 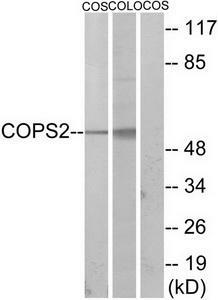 COPS2 monoclonal antibody (M02), clone 4B12. 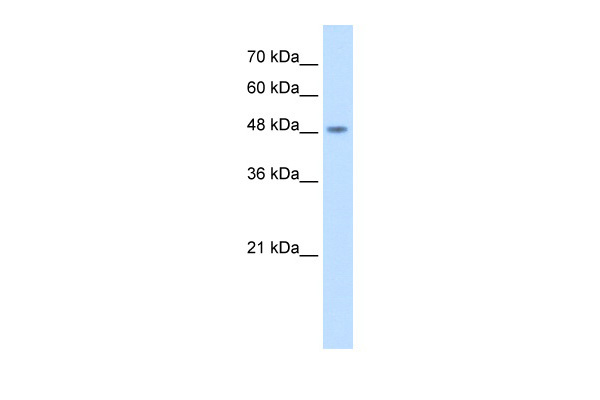 Western Blot analysis of COPS2 expression in PC-12(Cat # L012V1 ). Western blot analysis of TRIP15 Antibody (Cat.-No AP01234PU-N) in extracts from COS-7 cells. 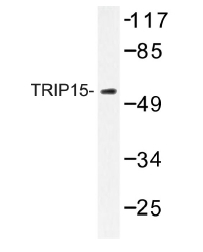 Antibody staining (0.03µg/ml) of NIH-3T3 lysates (RIPA buffer, 30µg total protein per lane). Primary incubated for 1 hour. Detected by western blot using chemiluminescence. Immunofluorescence analysis of A549 cells, using COPS2 Antibody. The picture on the right is treated with the synthesized peptide. 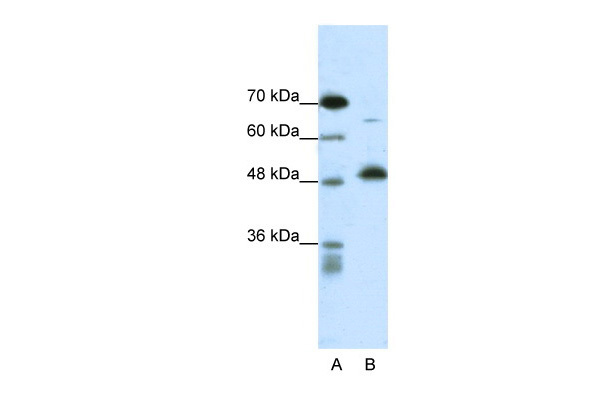 Western blot analysis of extracts from COS7/COLO205 cells, using COPS2 Antibody. The lane on the right is treated with the synthesized peptide. 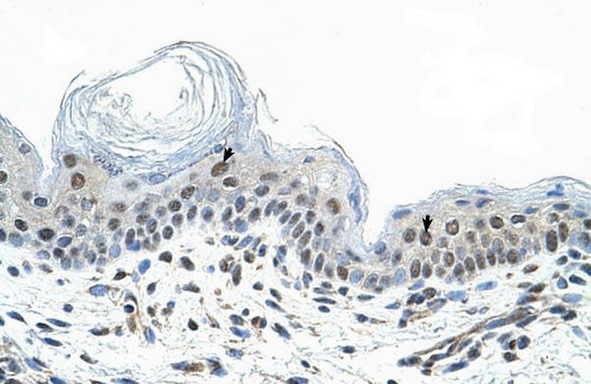 TA302410 staining (1µg/ml) of NIH-3T3 lysates (RIPA buffer, 30µg total protein per lane). Primary incubated for 1 hour. Detected by western blot using chemiluminescence. 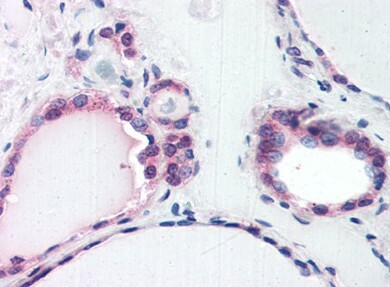 In paraffin embedded Human Thyroid Gland shows nclear and cytoplasm staining in activated epithelial cells Recommended concentration, 3-5µg/ml. Western blot analysis of extracts from COS-7 cells and COLO205 cells, using COPS2 antibody.The lane on the right is treated with the synthesized peptide. 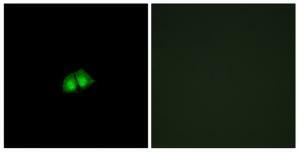 Immunofluorescence analysis of A549 cells, using COPS2 antibody.The picture on the right is treated with the synthesized peptide.